Recently, I went with my camera club on a long weekend to Norfolk. It is a part of the country I have not visited since childhood when my parents regularly took the family on holiday to West Runton, near Cromer. Those were idyllic days as the owner of the cottage where we stayed owned a large tract of land. This was a place where we children could roam safely and unsupervised. It takes the wisdom and experience gained from age to appreciate fully the freedoms enjoyed in those carefree times. This time around, Norfolk was a revelation. True, it is largely flat and lacking the hills and mountains normally associated with dramatic scenery. In its own way, though, it is just as appealing and has a quiet charm. Early spring was a good time to go. The blossom was out and the buds were just appearing on the trees, yet leaving their outlines still visible. Simply driving through such attractive countryside was an enjoyable experience. That the roads have so little traffic was an added benefit. For my first photo of the trip, I have chosen an image which encapsulates much of the Norfolk landscape. The location is close to Barton Broad which, understandably, is one of the flattest areas of the county. 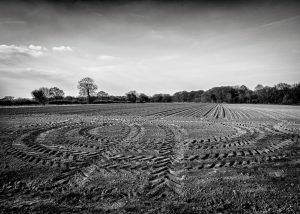 What attracted me to the scene was the contrast between the circular tracks and the straight lines of the ploughed field. It was a shot which was crying out to be rendered in monochrome. While I usually avoid discussing the equipment I use to create a specific image, it is worth mentioning in this instance. I tend to prefer lenses with a standard or short telephoto focal length as it is easier to isolate the subject. For a few months now, I have owned the excellent Fuji-X 14 f/2.8 wide-angle lens. It is very sharp and unlike most short focal length lenses, it has minimal distortion. Despite being in my camera bag, I have never felt the need to use it. 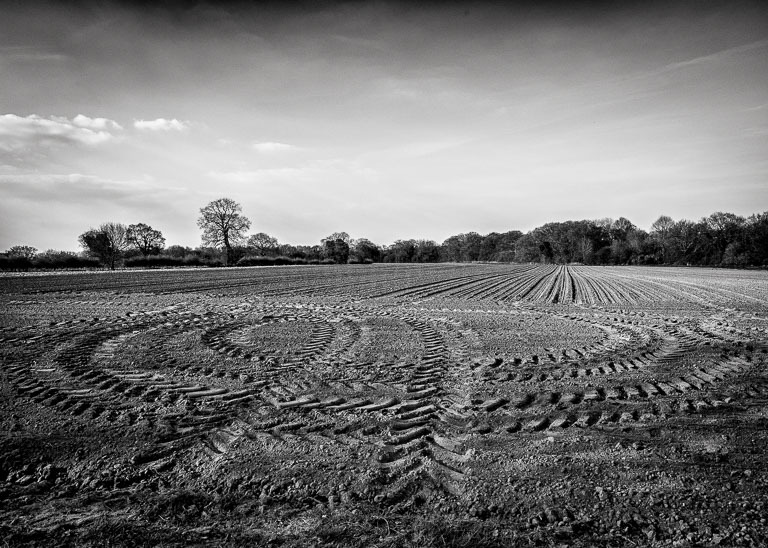 Until now, when it allowed me to emphasise the tyre tracks in the foreground. Once on the camera, I found that I did not want to take it off and was seeing wide-angle shots everywhere. The lens finally saw some extended use during the trip.